Instead of simply recounting what you did right and wrong and what you'd like to do going forward, grade yourself on your consistency. Your consistency grade requires a list of your best practices. These are the things you do when you're at your best. They can be lifestyle choices, such as how you eat or exercise; they can be best trading practices; they can be best practices in terms of your romantic and family relationships. In other words, the list consists of the things that define you at your best. Your consistency grade represents a frequency count of the number of days in the past week in which you have enacted that best practice. When our two youngest children were very young, we created "sticker charts" for them. Each day they cleaned their room, played well together, and ate well, they received a sticker. If they received stickers every day of the week, they could cash those in for a toy or fun thing to shop for over the weekend. The key to the exercise was the requirement that stickers had to be earned every day. That rewarded not just good behavior, but consistency in good behavior. 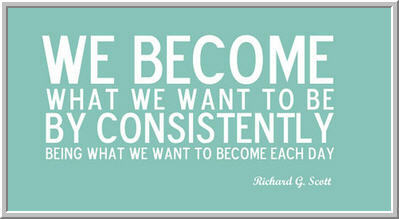 It's that consistency that builds positive habit patterns. Imagine an adult equivalent of the sticker chart: If you can check the boxes on your best practices list every day, you arrange a reward experience on the weekend. Perhaps it's a reward experience with someone you love, giving an extra incentive to achieve consistency. Most traders are achievement oriented. If they set up this kind of system and make it public (we hung the sticker charts on the refrigerator), they will want to check the boxes. They will not want to fall short of a goal they commit to. The hard part in making changes is getting to that place in which desired behaviors become routine behaviors. It's easy to fall back into old patterns before the new ones take root. 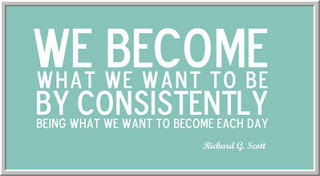 Structuring your work on yourself--and on your trading--as work on consistency helps you make that transition, building those new, positive habits one day at a time.